Pushkar (The Holy City) is a town in the Ajmer district in the state of Rajasthan, India. It is situated at 14 km North West from Ajmer at an average elevation of 510 metres, and is one of the five sacred dhams (pilgrimage sites for devout Hindus). It is often called “Tirth Raj” – the king of pilgrimage sites – and has in recent years become a popular destination for foreign tourists. The Mahabharata says that while laying down a programme for Maharaja Yudhishthara travel, “Maharaja after entering the Jungles of Sind and crossing the small rivers on the way should bathe in Pushkara”. And, as per Vaman Purana, Prahlada on his pilgrimage to holy places visited Pushkarayana. A Gurjara Pratihara (Gurjar) ruler of Mandore, Nahadarava, restored this tirtha in the seventh century. He got the place cleared and the lake restored by making an embankment on the side of the river Luni. He rebuilt old palaces and built twelve dharmashalas (resting places) and ghats on three sides of the lake. According to Rajputana Gazetteer Pushkar was held by Chechi Gurjars (Gujjars) till about 700 years ago. Later Some shrines were occupied by Kanphati Jogis. There are still priests from Gujar community in Pushkar temple, known as Bhopas.The sage Parasara is said to have been born here. His descendants, called Parasara Brahamanas, are found in Pushkar and the surrounding area. The famous temple of Jeenmata has been cared for by Parasara Brahmans for the last 1,000 years. Pushkarana Brahamanas may also have originated here.It is also the venue of the annual Pushkar Camel Fair. In 1901, the town was part of the had a population of 3,831. The most important temple in Pushkar is the Temple of Lord Brahma, one of the holy trinity of Hinduism. In fact it is the only Hindu shrine in the world where Lord Brahma is worshipped. The temple enshrines a life-size idol of Lord Brahma. Varah Temple is dedicated to Lord Vishnu. One of the various incarnations of Lord Vishnu was that of Varah (boar). The temple worships the Varah form of Lord Vishnu. Later Sawai Jai Singh II, the Maharajah of Jaipur reconstructed the temple. Lord Vishnu is seen as one of the Hindu trinity – Brahma, Vishnu and Maheswar. Vishnu represents the Sustenance of creation while other two gods represents Creation and Destruction. The prime attraction of Pushkar is the Pushkar Lake which is considered sacred like the Mansarovar Lake in Tibet. 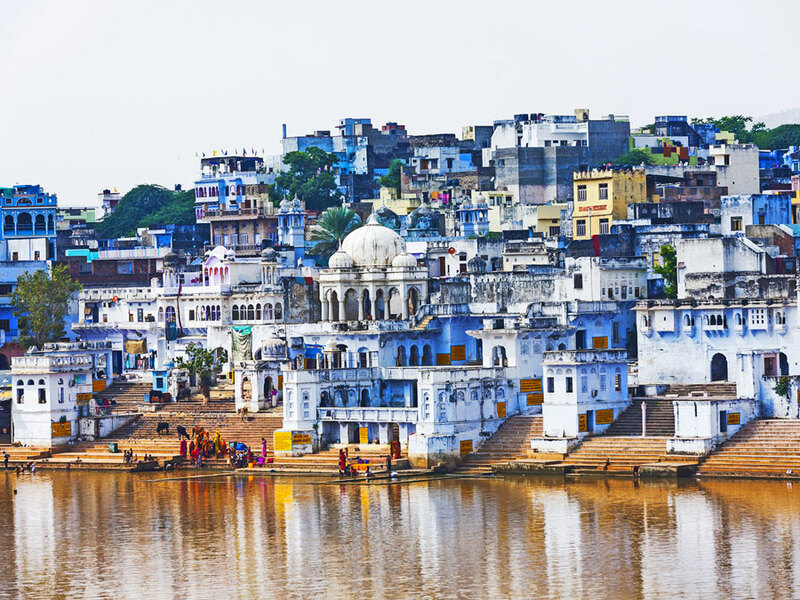 Pushkar has become a place of Hindu pilgrimage because of this holy lake. Legend has it that this lake was consecrated to Lord Brahma, the creator of the universe when a Lotus dropped from his hand into the vale and a lake emerged in that place. Ajmer Bus Stand is well connected by road with Jaipur, Jodhpur & Udaipur with Luxury AC Coaches.